As the worst Ebola outbreak in history continues to sweep across West Africa, many around the world are searching for a cure. The virus, which kills roughly 60 percent of people infected and is transmitted through human or animal contact, is difficult to study. While other fatal viruses such as HIV are predictable, Ebola seems to emerge without notice, and infects relatively fewer people. Moreover, there are only a handful of facilities equipped to handle the virus, which further slows any research process. But despite the difficulties, a few pharmaceutical companies have been working with the U.S. military to help find a drug that can take on the deadly virus, which has killed more than 700 people and infected more than 1,000 since March in Guinea, Sierra Leone and Liberia. Here are three treatments currently in the works. Researchers at Mapp Biopharmaceuticals are hoping to fight Ebola using a drug developed with the help of tobacco leaves. Their method involves two steps, passive immunization, which means the antibodies attack the virus directly, combined with active immunization, something that helps boost the patients immune system to fight back on its own. Another team has figured out how to combine these treatments using plants as a pharmaceutical production line. “We can manufacture both of these post-Ebola exposure reagents for a defensive stockpile, using tobacco,” said Charles Arntzen, a researcher at Arizona State’s Biodesign Institute, who authored a paper on the subject, in an ASU report. They tested a few compounds on mice and found that 80 percent survived, but this technology is still far from human trials. Tekmira Pharmaceuticals Corp. (TSE:TKM), a Canadian company, has been working on a treatment for four years as part of a $140 million contract with the U.S. Department of Defense. Their treatment, TKM-EBOLA, uses “Lipid Nanoparticle” technology, which sends the drugs through the patient's bloodsteam with tiny oil particles. The process, called small interfering RNA (siRNA), has already saved primates injected with a fatal amount of the virus. In January, their researchers dosed their first human subjects in a clinical trial, but it’s nowhere near ready for distribution. The Canadian company’s stock has soared more than 50 percent in the past two weeks. “What Wall Street does is that it sees an Ebola crisis and it sees Tekmira with an Ebola medical countermeasure that has shown a 100 percent effectiveness in animals,” Maxim Group analyst Jason Kolbert said to Reuters. For a few decades now, doctors treating outbreaks have toyed with the idea of injecting blood from those who survived the virus into patients showing symptoms. But the theory hasn’t been well-tested. As Newsweek reported, at the tail end of a 1995 outbreak in Zaire, medical professionals who had survived an infection earlier donated their blood to eight health workers showing Ebola symptoms, and seven of eight people survived. A 14-year-old survivor recently donated his blood to the American Dr. Kent Brantly, who was working in Liberia but started showing symptoms. The transfusion treatment was also used when treating other infectious diseases around the world, but it has been difficult to test on Ebola specifically, which is unpredictable and infects relatively fewer people. 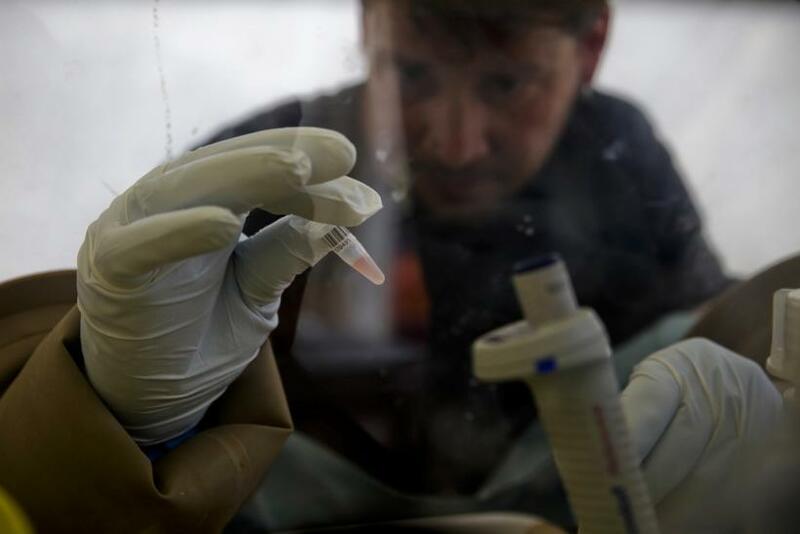 “There are so many things we don’t know about why somebody may recover and which antibodies might be effective,” said Dr. Thomas Frieden, director of the U.S. Centers for Disease Control and Prevention, to NBC. The method has been tried a few times on monkeys and reportedly hasn’t been effective. “The sad fact is we don’t have any proven treatment for Ebola. We don’t have any proven vaccine against Ebola,” Frieden said. How Bad Is Ebola Outbreak In West Africa?